Garfish Kirribilli sits in the centre of the Kirribilli restaurant scene, only a short stroll from fantastic harbour views, the city skyline and bridge. Our café style dining provides the ideal ambience to enjoy the warmer weather, during the daytime or for an evening meal as the days grow longer. A short walk from the North Sydney CBD or metres from Milsons Point train station, we’re easy to access and also a good option for professionals in need of an escape from the office. 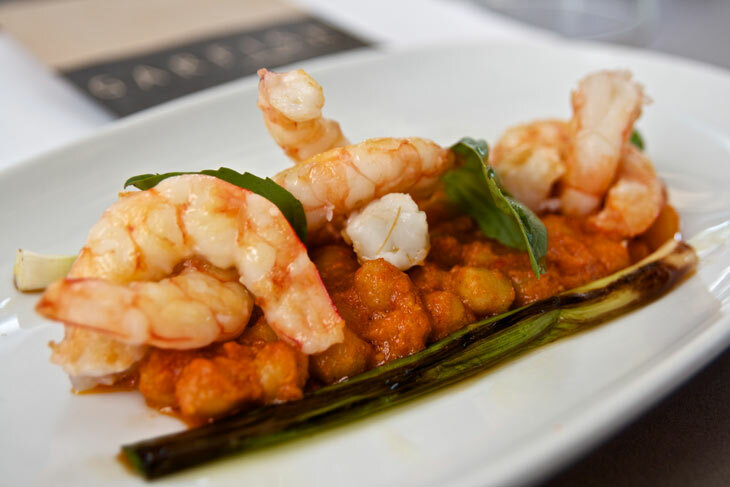 This week Garfish Chefs Stewart and John teamed up to demonstrate this featured entree: grilled king prawns with grilled baby leeks, chickpeas, basil and romesco sauce. Watch the video then read on for more highlights from the Kirribilli 2013 Spring Menu. This entrée is a simple and refreshing start to any meal at Garfish Kirribilli. It embraces a layering of flavours, from the sweetness of the scallops and caramelised onions, then contrasts it with the salty kick of the pancetta and the refreshingly sharp flavours of the sherry. Don’t miss this light, spring dish! This main combines the simple, earthy flavours of the squid ink in the angel hair pasta, with the robust taste of the king prawns. Preserved lemon, garlic and chilli brings out a salty punch to the dish. It’s a definite springtime must for king prawn lovers. This curry offers the best of sweet and spicy. Galangal, turmeric, coriander and tamarin spice things up, while the coconut cream adds a creamy layer. Very ripe, sweet pineapple, combined with a fish sauce incorporating lime juice, cucumber and palm sugar balances this dish out for a refreshing and satisfying curry that won’t disappoint. This is an elegant and surprising dish, not least because of the concept of braising watermelon! Apple and mint flavoured jelly is paired with braised watermelon, which is cooked in watermelon juice and grenadine, until it’s deep and vibrant in colour. Finally, the addition of the strawberries combines three elements that marry into an intoxicatingly sweet dessert. Better yet, this dish is dairy free, gluten free and egg free, so eat your heart out! Read more about our current Spring Menu.